with rent, utilities, food, medicine and other essentials. coordinate with other agencies to assist our clients with these and additional needs such as clothing or furniture. we respond to most requests for help by conducting a home visit by two of our volunteers. Discussions are always confidential, and include an overview of needs, current financial situation and sources of help. Typical people served in 2016 include families facing eviction or utility disconnection; homeless; a family living without heat and electricity for several months; parents who have lost their jobs; single mothers struggling to make ends meet; and victims of domestic violence. We made 251 personal visits and 69 other contacts, which provided help to 568 people. Our operating expenses were about 1 % to cover postage, office supplies, and other items. Our volunteers devoted almost 4,500 hours of service and traveled more than 5,200 miles in service to the needy in 2016. School Supply drive, in cooperation with many other area churches and businesses, provided supplies to over 2000 needy children. The Blanket Sunday collection, in conjunction with St. Mary’s (Painesville), provided blankets and bedding to almost 200 people. Share-A-Christmas helped approximately 150 families (700 individuals) in our area. We can only help when we have the means to do so. Your contributions help us help others. Without a generous bequest from a non-parishioner, we would have run out of funds and had to turn away almost 76 families we helped this year. Remember, as Jesus said, “what you did for the least of my brothers and sisters, you did it to me”. 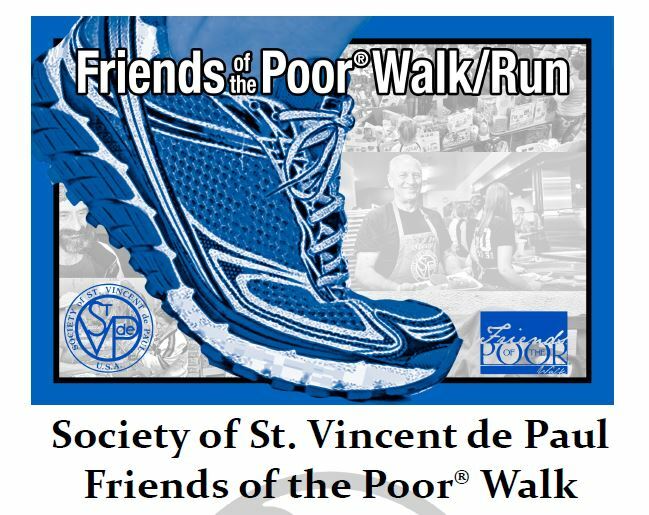 The Society of St. Vincent de Paul is an international Catholic lay organization offering person-to-person service to the needy and suffering. Founded in France in 1833, the Society reached the U.S in 1845 and Cleveland in 1865. In 2015 we celebrated the 150th anniversary of our presence in the Cleveland diocese. The St. Gabriel conference was organized in 1986. Our conference has been providing assistance in Lake County forover 30 years. Funds for our ministry come from you, from quarterly collections, and the charity of St. Gabriel parishioners. We also received several memorial contributions this past year. Walk/Pledge to help the poor. Register Online (fopwalk.org) or in person at the walk. Being Christ • EveryDay • Everywhere. May God bless YOU for your continued generosity. YOU help us to help others. For anyone interested in learning more about our activities and considering becoming a Member of this outreach team please contact the Church Office.